Born a sharecropper’s son in rural North Carolina, Rev. Aaron Johnson has worked as a tireless advocate for social justice. After leading early sit-ins under Martin Luther King Jr.’s tutelage, Johnson advised three N.C. governors on race relations and served as the state’s corrections secretary while pastoring a Fayetteville, N.C., church. Johnson shows us how human hatred and fear smells, sounds and feels—and how it feels to empower others with hope and trust. Aaron Johnson’s story reminds us how much one individual, with focus and faith, can do to change the world, despite repeated hurdles. Readers will come to know Johnson as a friend and inspiring hero who suspects that God still has a few projects waiting for him on his to-do list. Rev./Dr. Aaron Johnson of Fayetteville, NC was guest speaker at three Greensboro institutions in celebration of Black History Month. Sponsored by The Micah Project, Johnson addressed a gathering at Bass Chapel United Methodist Church on Sunday, February 21, recounting lessons learned from his pioneering civil rights work in North Carolina. On Monday, February 22, Johnson shared more of his story at a lunch meeting with a small group of honors program students and their professors at Bennett College, and with 60 honors students at A&T University Monday evening. Johnson recounted his beginnings as the son of a Pender County sharecropper, working his way through Shaw University in Raleigh, and his entrance into social justice activism under the tutelage of Dr. Martin Luther King. He went on to serve three North Carolina governors, and hold various civic positions in addition to serving as a church pastor for 45 years. Johnson encouraged his audiences to identify a cause worth fighting for and to remember that freedom will always be an ongoing pursuit. His life is chronicled in his 2010 memoir “Man from Macedonia," available through The Micah Project and book retailers. In August 2012, Aaron was the keynote speaker at the Southeast Regional Conference for Coalition of Prison Evangelists (COPE) in Greensboro, NC. Also on the platform at that conference was Bobby McGee, a former prisoner who now ministers in music and testimony with his wife, Nancy, in a ministrry called ChristSong. Bobby spent twenty years in the custody of the NC Department of Corrections, which included the eight years while Aaron Johnson was the Secretary of the DOC. In an emotional moment, Bobby shared about the changes he saw, from the inside, when Aaron came to the office and implemented some long overdue directives, resulting in more humane treatment of the prisoners under his charge. Click image to view video. Rev. Johnson reunites with the "10"
Rev. Aaron Johnson was present at a reunion of the Wilmington10 survivors at Gregory Congregational Church in Wilmington on Saturday, January 5, 2013, following the December 31 pardons by outgoing North Carolina Governor Beverly Perdue. Aaron recounted his emotional reunion with Ben Chavis and the missing files that might have exculpated the “10.” Read more about this in chapters 22 through 25 in "Man from Macedonia." 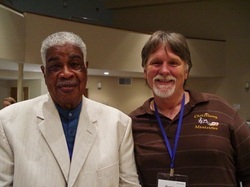 November 2, 2011, Aaron spoke at the International COPE (Coalition of Prison Evangelists) Conference in Melbourne, FL. Speaking from his experience as the first African American Secretary of the Department of Corrections in NC (1984-1992), his message resonates with those who go behind the walls regularly to minister. 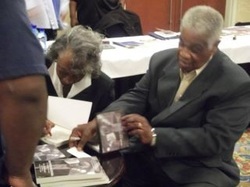 At left, Aaron and Mattie autograph books for attendees. August 23, 2012 - Aaron spoke at the Southeast Regional COPE Conference in Greensboro, NC. Aaron shared the podium with Bobby McGeem who was incarcerated in the NC Department of Corrections during Aaron's tenure as Secretary. In October 2011, Aaron spoke at State Leadership Week at Child Evangelism Fellowship headquarters in Warrenton, MO. The group had had workshops on cultural sensitivity all week, and it was very fitting that Aaron told personal stories about racism and reconciliation. I witnessed many tears in the audience as he spoke. After Aaron spoke, Vices President of USA Ministries, Moises Esteves asked the state director from Georgia to pray for Aaron. The irony is that the night before, I had dinner with this man, and he told me about growing up in eastern NC, and about his grandfather who was a member of the Ku Klux Klan. Also, after the talk, when Aaron was greeting folks, a woman from NC came to him sobbing. She had grown up in the same county as Aaron, and was only a few years younger than Aaron. She was apologizing, and asking for forgiveness for the sins of her community. Their embrace was a beautiful picture of reconciliation. We know that God is honored and the Kingdom is promoted when walls are broken down, and reconciliation takes place. 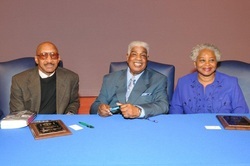 On February 1, 2011, Aaron spoke to a packed auditorium at the kickoff for Black History Month at Fayetteville State University. Aaron (center) is pictured here with Dr. Stanley Johnson and Dr. Annie McCulloch Chavis, recipients of FSU's Humanitarian Awards. 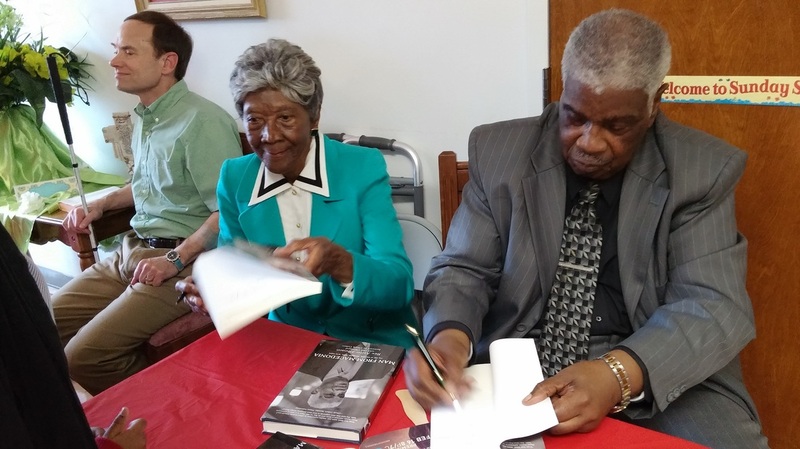 On Wednesday, December 8, 2010, Aaron spoke and signed copies of his memoir at the International Civil Rights Center and Museum, located at the corner of Elm and February One Place in Greensboro, NC. This event was sponsored by Leadership NC. Aaron Johnson's indepth interview with John Seigenthaler on Nashville Public Television's "A Word on Words " aired on Sunday, June 7, 2010. To hear the interview click here. When you get to the list, scroll down to the 06/07/2010 date and click the arrow. See Aaron on "North Carolina People"
Click here to see an interview with Dr. Aaron Johnson with Dr. William Friday on UNC-TV's "North Carolina People." The program aired May 14 & 16, 2010.